More reason to smile! 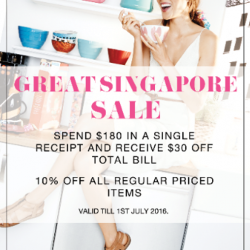 This Great Singapore Sale, spend $180 and receive $30 off your total bill! Valid till 1st July 2016. Happy May Day! 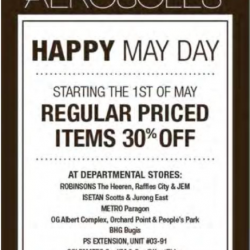 Starting the 1st of May: Regular Priced Items 30% off at Aerosoles. 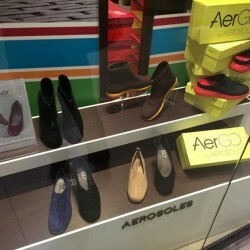 Enjoy 20% off all regular price shoes at Aerosoles Shop. For a limited time only. Present the picture below at Aerosoles shop to enjoy Additional 10% on AERGO till 30 sep 2014. 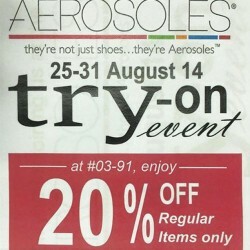 Aerosoles Singapore ia having a "try on and feel" event at Plaza Singapura. 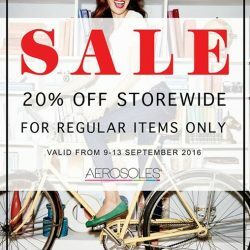 In additional get a 20% discount if you indeed find a pair you fancy from now till September end.